Sunflowers are huge. The Guinness World Record holder was over 30ft tall, which is roughly four Shaqs. They're also heliotropes, which means they turn to follow the sun as it moves across the sky from east to west. But reaching higher than a pyramid of NBA players and worshipping the sun with the same zeal that Audrey II guzzles human blood aren't all these flowers have going for them. Packed inside those humongous heads are tiny treats called sunflower seeds. 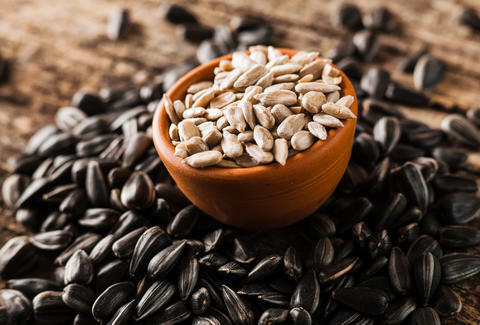 Sunflower seeds are an excellent source of vitamin E, an important antioxidant with incredible anti-inflammatory properties, which can assist those with asthma, arthritis, and other annoying afflictions (can I get an amen?). Antioxidants like vitamin E also fight free radicals, which is not a nickname for your parents in the '60s, but instead refers to these crazy, unstable atoms in the body that have been connected to such buzzkills as heart disease and cancer. Sunflowers have a reputation for making people happy, and it's not just because of their cheerful appearance. Their seeds are loaded with magnesium, a mineral that may help alleviate depression, insomnia, headaches, and other life ruiners. Our ancestors got plenty of magnesium from fish, organ meats, and produce grown in mineral-rich soil, but today we have to make an extra effort to incorporate it into our diets. So if you A) like being happy, and B) think they call it "offal" for a reason, skip the sweetbreads and score some sunflower seeds instead. Back in the day, baseball players would often chew tobacco during games. Once the field of medicine advanced beyond doctors endorsing tobacco products, however, the habit's popularity declined, with many players switching to sunflower seeds around the 1950s. The sunny seeds have been a staple of the sport ever since, but you don't have to be a baseball fan to snack on sunflower seeds. Pretty much the only requirement is teeth. Sunflower seeds are inexpensive and readily available, and they make a great addition to lots of meals you already eat. Sprinkle them on a salad, bake them into bread, or grind them into "butter," but for the love of God, don't make a habit of eating the shells. The best-case scenario is constipation; the worst is a hole in the digestive tract. If you were that kid who was always swallowing his gum, you might want to play it safe and get the shell-free kernels. Whatever type you choose, get your hands on some of these seeds STAT. Katie McDonough is a freelance writer and editor who pops sunflower seeds like Tic Tacs. Follow her @thewritekatie.